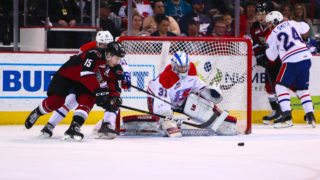 Jason McKee’s Vancouver Giants secured all six available points this week thanks to their third straight victory Saturday night in Langley. Rookie defenceman Alex Kannok Leipert broke open a 4-4 tie with 3:06 remaining in the third period to help lift the Giants to a hard-fought 5-4 victory over the visiting Medicine Hat Tigers. Ty Ronning inched a little closer to history with his 47th goal of the season, and earned his 200th career WHL point with an assist on the game-winning goal. Tyler Benson, Dawson Holt and James Malm also added two points each for the G-Men who have now won three straight, and finished their eight-game home stand with a 4-2-2 record. Elijah Brown led all Tigers with a goal and an assist in response. Territorially the Tigers dictated the play in the first period, outshooting the Giants 19-10. Giants starter David Tendeck had to be sharp, making a couple of clutch saves in the opening frame. 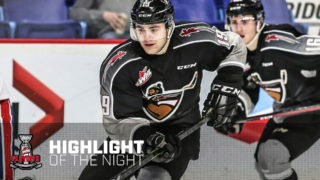 Vancouver rewarded their netminder for his efforts at 13:07 when Tyler Popowich parked himself in front of Tigers starter Jordan Hollett and shovelled home a James Malm rebound for his sixth of the season and his second goal in a span of three games. The two clubs combined for five goals in the middle period. Tigers defenceman Dalton Gally tied the score at 5:17 when his low shot from the left point snuck through traffic and past Tendeck for his second goal of the season. Three minutes and 30 seconds later the Giants regained their lead when rookie defenceman Bowen Byram snuck a low shot through the legs of Hollett and home for his sixth of the season, and his third in a span of two games. Tyler Benson and James Malm both assisted on Byram’s go-ahead goal. 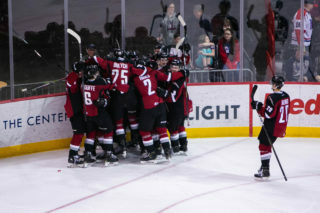 46 seconds later the G-Men increased their lead when the trio of Brayden Watts, Davis Koch and Ty Ronning combined for what would end up as Ronning’s team-leading 47th of the season off an odd-man rush. Shortly after Ronning’s goal, Tigers goaltender Jordan Hollett left the game with an apparent lower-body injury. In came 20-year-old Michael Bullion who finished off the night. Hollett had 19 saves on 22 shots faced while Bullion turned aside 15 of the 17 fired his way. With under four minutes remaining in the second, the Tigers struck twice in quick succession to get back on even terms. First it was Gary Haden at the 16:11 mark who parked himself at the right side of the Giants goal and knocked home a Cole Clayton rebound that bounced to him after hitting the right goal post. Then at 18:09 the Tigers evened the score when Jaeger White and Elijah Brown combined off a two-on-one rush. White led the rush down the left-wing and centered a perfect feed to Brown who backhanded the pass by the left leg of Tendeck for his third of the season. Shots were 29-28 Vancouver after two, and the score was deadlocked at 3-3. Dawson Holt gave the Giants their third lead of the night at the nine-minute mark of the third when he pounced on a Tyler Benson rebound and wired his ninth of the season past Bullion’s blocker. James Malm was credited with the second assist on the goal from Vancouver’s January Player of the Month. Vancouver’s lead would last a grand total of a minute and 12 seconds. Back came the Tigers when Dylan MacPherson’s shot from the right point deflected off a Giants’ stick, up high and over the shoulder of Tendeck for his third of the season, marking the third time the Tigers had erased a Vancouver lead. Overtime seemed imminent as time winded down in the third, but with just over three minutes remaining the Giants would grab their fourth and final lead of the night. Ty Ronning won a puck free behind the Tigers net, and fed a pass to Brayden Watts along the right wing. Watts had time, and drew the defense towards him before finding Alex Kannok Leipert pinching from the right point. Kannok Leipert one-timed Watts’ feed past Bullion and home for his third goal of the season giving the Giants a 5-4 lead! From there, the Giants were in complete control as the Tigers had trouble getting anything generated with their net empty. Moments later the final horn would sound, signalling the 28th victory of the season for the Giants and the end of a four-game, seven-day road trip for the Tigers. Medicine Hat finished with a slight 42-39 edge in shots, but went zero-for-two on their power play chances. Vancouver went a full 60 minutes without a power play opportunity. 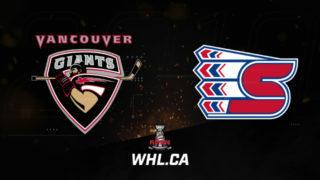 With the victory the Giants sit four-points back of both Kelowna and Victoria for top spot in the B.C. Division while holding a 12-point lead on Kamloops for a top-three playoff spot in the B.C. Division. The Giants will look to inch a little closer to first when they head to Kelowna on Wednesday for a showdown with the Rockets at 7:05 PM. From December 29th on, the Vancouver Giants have just two regulation losses in a span of 16 games. In that span, their record is: 10-2-3-1. 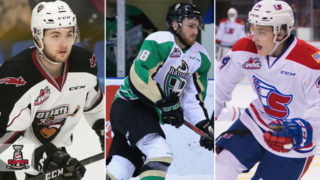 With 47 goals now, Ty Ronning sits one goal shy of matching Evander Kane’s single-season franchise record for goals in a season. He’s two shy of a new franchise single-season record and three-goals shy of becoming the first Giant to ever score 50 in a season. Saturday’s game marked the first game all season where the Giants did not have a single power play opportunity.